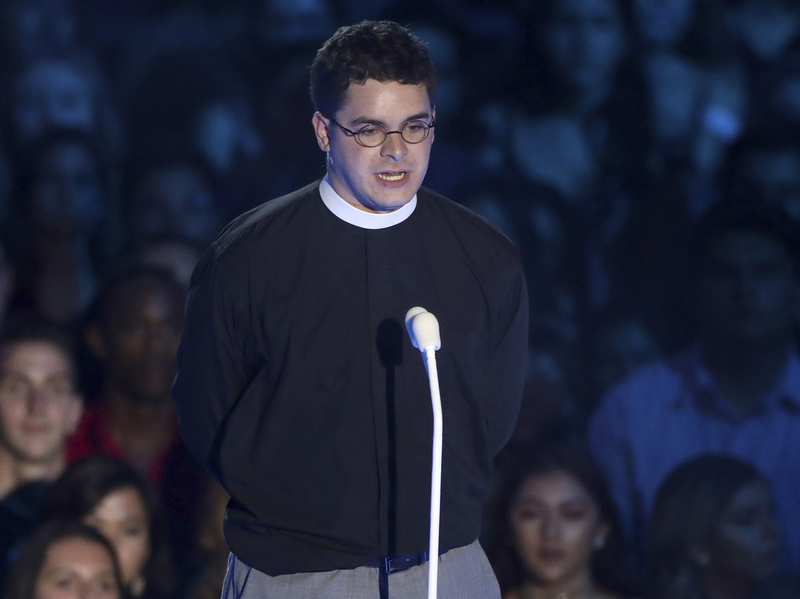 Lee Relative Who Denounced White Supremacy Resigns As Pastor Of N.C. Church : The Two-Way Robert W. Lee IV said some members of his congregation were uncomfortable with the media attention he received after his speech against racism and hate on MTV's Video Music Awards in August. The Rev. Robert Wright Lee, a relative of Confederate Gen. Robert E. Lee, resigned on Monday as pastor from a North Carolina church. Above, Lee speaks at the MTV Video Music Awards in August. A descendant of a nephew of Confederate Gen. Robert E. Lee announced yesterday that he had resigned as pastor of his church in Winston-Salem, N.C. Robert Wright Lee IV, who came to national attention denouncing his relative's legacy on NPR and elsewhere, said he made the decision after Bethany United Church of Christ moved to vote on his tenure there. "We are all called by God to speak out against hate and evil in all its many forms," he wrote in a blog post. "There are so many good things going on with this congregation and I do not want my fight to detract from the mission. If the recent media attention causes concern with my church, I reluctantly offer my resignation." A week after violence rocked Charlottesville, Va., Lee spoke to NPR's Weekend Edition about his famous uncle, many generations removed. He said he thought the statues of Lee should be removed. "I do think they need to come down," Lee said. "I think it's time that we have a conversation about how to remember our past without commemorating our past." He said his objections to his uncle's legacy were rooted in his Christian beliefs. "[T]his is a form of idolatry, very plain and simply," he said. "We have made an idol of Robert Edward Lee. We have made him an idol of white supremacy. We have made him an idol of nationalism and of bigotry and of hate and of racism. And that's unacceptable. And not only as a person of goodwill but ... as a Christian, I can no longer sit by and allow my family's name to be used as hate-filled speech." NPR's Lulu Garcia-Navarro asked Lee how his parishioners were responding to his message. "Well, I would say it's not the message that we're used to hearing from our pulpits," Lee replied. "But maybe now is the time to start having those messages. ... We have not spoken out for people of color, and we have to start doing that if we want to make a difference in this world and if we want to be relevant as a church in the 21st century." The following week, Lee addressed MTV's Video Music Awards and struck the same chords. "We have made my ancestor an idol of white supremacy, racism, and hate," he said. "As a pastor, it is my moral duty to speak out against racism, America's original sin." "Today, I call on all of us with privilege and power to answer God's call to confront racism and white supremacy head-on," he added. "We can find inspiration in the Black Lives Matter movement, the women who marched in the Women's March in January, and, especially, Heather Heyer, who died fighting for her beliefs in Charlottesville." But not everyone in his congregation approved of Lee's message. Monday, Lee said his resignation was tied to the attention he attracted at the VMAs. "A faction of church members were concerned about my speech and that I lifted up Black Lives Matter movement, the Women's March, and Heather Heyer as examples of racial justice work," he wrote. "I want to stress that there were many in the congregation who supported my right to free speech, yet were uncomfortable with the attention the church was receiving. The church's reaction was deeply hurtful to me." Lee began serving as the pastor at Bethany in April; it was his first job after graduating from seminary at Duke Divinity School. Calls by NPR to a listed number for the church on Tuesday were not answered. "A theologian I admire speaks of costly grace and sometimes speaking up costs more than we could have imagined," Lee said in a statement to a Charlotte television station. "I love my church and will always have fond memories there for my first pastorate."